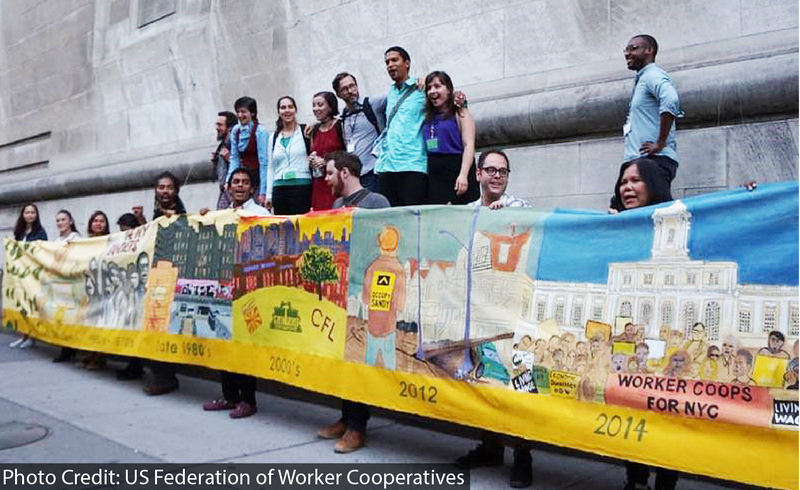 Cooperative leaders display a visual timeline of NYC worker co-op history. New Economy Project was pleased to participate in New Economy Coalition’s CommonBound Conference, held this June in St. Louis, Missouri. CommonBound is a biennial gathering that brings together leaders from more than 200 groups across the US and Canada, working to build an economy grounded in shared values of democracy, justice, and ecological sustainability. We spoke about our new economy organizing work on several panels at the conference, including “Building Blocks for City Campaigns for a New Economy.” Here are remarks that Campaign Organizer Mike Sandmel presented on the panel. My name is Mike Sandmel. I’m here from NYC where I was born, have lived most of my life, and where I organize for economic democracy and cooperative development with a group called New Economy Project. We’re a citywide economic justice organization founded in 1995. We’re fighting, in close partnership with community-based groups throughout the city, for a new economy vision of economic development, grounded in racial and economic justice. NYC is a really interesting place to do New Economy organizing. It’s full of contradictions and opportunity, deep inequality and a history not just of popular mobilization but of building community-controlled economic institutions. In the late 19th century, when my immigrant great grandparents were working in Manhattan sweatshops, unions like the Knights of Labor invested heavily in organizing worker cooperatives all over the city. In the early 20th century, as waves of black southerners came to New York they organized food co-ops and credit unions in neighborhoods like Harlem, to build community wealth and to create alternatives to exploitative institutions. In the years around World War II, labor unions like the International Ladies Garment Workers Union started building large housing co-ops to provide affordable homes to working class New Yorkers. In the 1960s and 1970s, white flight and stagnation left neighborhoods, like the one my mom grew up in in the Bronx, in flames. New Yorkers, mostly of color, got together and won the right to convert buildings that had been taken over by the City into low-income housing co-ops. Today there are more than 1,000 of these buildings, providing some of the most deeply affordable housing in an otherwise unaffordable city. The same organizing energy in the 1970s and 1980s led to the creation of hundreds of community gardens, many of which are still thriving, a wave of new community development credit unions, and the first, and for a long time the only, community land trust in the city. We also started to see a gradual resurgence of worker co-ops, starting with Cooperative Home Care Associates, as a way to build security and power for immigrant workers, mostly in the services sector. I was born in Manhattan in the late 1980s and over my lifetime the city has changed a lot. Some scholars have called it “hyper-gentrification.” New York’s become a microcosm of the larger patterns of extreme inequality emanating from the financial district. This of course came to a head with the financial crisis in 2008. One response has been a rediscovery of cooperative economics. The growth of the cooperative movement, and the extent to which it’s re-entered mainstream political conversation in NYC in the last 10 years, and especially in the last 5, is, I think, quite promising. The work that we’re doing at New Economy Project, in partnership with groups throughout NYC, is about building on that momentum, learning from the cooperative movement’s successes in places like Quebec, Barcelona, Northern Italy, and Seoul, and trying to grow the cooperative economy to a scale where it challenges the dominance of neoliberal institutions that make living in New York so challenging for working class people. Shortly after the crisis, a group of activists took an interest in co-ops and started a research collective called Solidarity NYC. They unearthed important stories from the history of New York City’s solidarity economy, mapped a wide range of active projects and businesses in communities across the five boroughs, and convened a variety of activities to help people see their cooperative work as part of a larger whole. Eventually (and New Economy Project played a part in this) that evolved into a membership organization called the Cooperative Economics Alliance of NYC, which is effectively a co-op chamber of commerce, the membership and influence of which continues to grow steadily. In 2009 many of the city’s worker cooperatives got together in a body called the NYC Network of Worker Co-ops, or NYCNoWC (which now has a dual-membership arrangement with CEANYC). In 2014, organizing with worker-owners and allied organizations, they got the City Council to allocate $1.2 million for worker co-op development as part of the Worker Co-op Business Development Initiative. In this year’s budget that allocation is now more than $3.5 million. Over the past five years this funding for development and technical assistance services has helped quadruple the number of worker co-ops in NYC from about 20 in 2014 to about 80 today, some of which are quite large. In 2013 New Economy Project, working with Picture the Homeless, took on the challenge of decommodifying land and creating permanently affordable housing through community land trusts. Together we created the NYC Community Land Initiative. Some people thought we were undertaking the impossible, given the deeply entrenched real estate industry in NYC, but through partnerships with a more than a dozen community organizations in low-income communities we’ve built major momentum around CLTs. We’ve seen several CLTs incorporate, and some are in the process of acquiring their first buildings. We’ve also won important policy changes, and though much work lies ahead, we’ve convinced City and State government to start allocating funding toward the model and developing more robust policies for community control of land. A few years back we started convening groups to push for creation of a public bank. NYC currently deposits our public money in Wall Street banks that invest in industries and engage in practices that directly harm New Yorkers and low-income neighborhoods and neighborhoods of color. A public bank would allow the City’s money to go toward equitable and community-controlled development and that’s central to our vision. We just had a launch action for that coalition, Public Bank NYC, a couple of weeks ago and it was a huge success and got a ton of press, and now we’re seeing a lot of interest from groups and elected officials. Almost everything that’s happened has happened through coalition efforts and it’s getting to the point where there are a lot of them. One thing we’re working on now, and it’s still in early stages, is trying to get those different coalitions together under a shared banner and with a shared policy agenda. We see this as a way to amplify the power of existing campaigns, to show how they fit together into a coherent and compelling vision for equitable economic development, and to open up space for additional demands. One idea that’s gaining traction is to create an NYC Office of Cooperative Economics, which is the kind of body that’s not uncommon in Latin America or Europe but is currently unheard of in the US. We think it could be a game changer. There’s much more to do, and much to learn from cooperative movements in other cities around the country and the world, but we’re excited about what we can accomplish, building on the work of those who came before us, and taking leadership from folks organizing in New York’s low income communities and communities of color, and giving life to the claim that another world is possible.